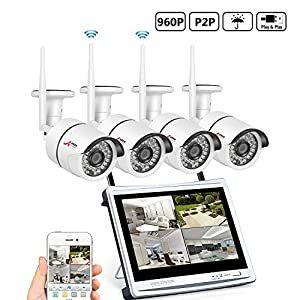 It’s time to pick the best outdoor wireless security camera system with DVR, and OMG I am going crazy just thinking about this review. It took me half a lifetime to check each one out and believe you me if you don’t have patience and a love for electronics you will be institutionalized. Anyway, as I try out my new comfy straight jacket, I decided to carefully write down the review of each item tested and checked. Now, did you know that by looking at a picture or photo you can’t learn anything? For example, when you look at the items I reviewed in my article on hidden cameras – how much can you learn from their images? Well, that’s true, you can’t, some items just cannot be bought from a photo…Oh mama that looks nice, let’s get one of those thingamy gadgets that does everything. 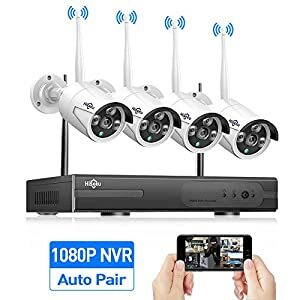 Outdoor wireless security camera systems with DVR are one of those items you must either test yourself or buy after reading an insider’s review. Which is why I am here! Just so you understand the sacrifice I made for you, I set up each and every system and tested them in daytime and nighttime conditions in both good and bad weather. The test was performed in an industrial set up with five locations being tested simultaneously, over a period of a month. Bottom line: There is a bonus section at the bottom of this review, where I add some of my most helpful buying tips. I’ll continue to update this review with emerging models, that’s if I am brave and still crazy enough to test out the latest models. I will explain my review system, so you don’t get confused. There are three sections to every review: Specifications, Functionality, and Installation. I will open with these three categories and then deliver my take on the system. The specs come directly from the manufacturer’s site, while the functionality and installation are my take and personally contributed based on the experience of installing and using each system. So, with no further ado, here goes: (and don’t look at the pictures, they are meaningless. I mean, can you really tell the functional differences between 4 or 8 cameras in a photo?). 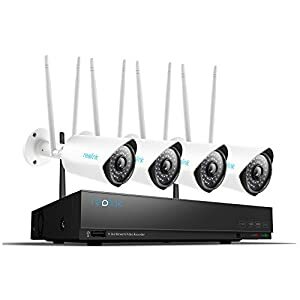 This system connects to any smartphone, tablet, iPad or another mobile device, as well as PC that is connected to the internet. You can access the camera system remotely and view what’s going on in real time. You also get notifications on your smartphone whenever an alarm is raised. 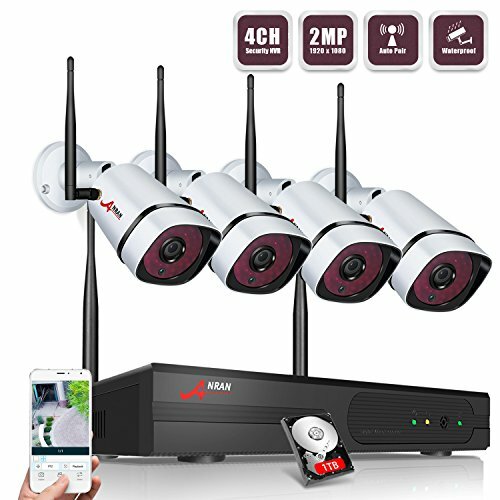 Since its a WiFi battery powered security camera, consider the battery replacement costs and time. The installation process is quite easy, you need to decide where you are going to place your cameras, since they are WIFI, they don’t need wires, and that saves you a lot of installation preparation and process. The NVR (network video recorder) comes with 2 TB drive, which is more than enough space for storing recordings. My take: This is a standard simple all contained system that offers you great ROI. Its easy to install, the cameras provide 72-HD which is enough detail for any recording. 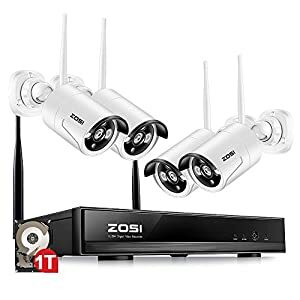 You aren’t going to the movies with this one, you are securing your location with a great, budget-friendly and wireless system. The SMONET Camera System Transmits is a video only system, there is no audio here. You can view the recordings from a distance, and the system will only transmit via the internet when you access it from your remote location. There is a pinch mode zoom function in the mobile interface, and the system is a wired system, not wireless, which makes it more reliable and saves on battery replacement. 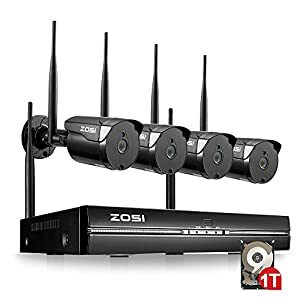 First, you need a screen to view the recordings, second you need to connect each camera to a power source, so while it is WIFI and transmits without a wire, it still needs wiring for power installation. While this saves on battery replacements, it does present you with installation issues. This is a simple system that provides basic viewing properties and is suitable for a conservative budget where basic CCTV is required. The 1 TB NVR disk is large enough for recorded video, but this system will overwrite old footage, so make sure you save all the important shots. They do claim it cannot view a car license plate, and they are correct, this is not a highly focused system, its good for basic home protection recording or office monitoring. This is a great value for money kit, providing you with 4 x 720P camera resolution that is both crisp and clear to view. Its motion detection activated which means it will only record when activated by motion. The unit comes with a wired and wireless solution, so you can either connect it by wire or go wireless and rely on batteries for power. This is a very easy system to install. I tried both connections, the wireless and wired, and apart from the usual installation requirements for wired, the whole process was fast and efficient. If you are seeking a comprehensive solution that incorporates two modes, wireless and wired, I would go for this system. I actually believe in wired more than wireless, however, I also am a great believer in risk mitigation and that means that you should use both so that if one method is compromised, the second method takes over, and, in addition, you can use a few fake cameras – it will help you save your money and will add some extra safety. This systems HD is 1 TB, so it provides ample room for recordings but what is better with it is that it only records when activated by motion. So, your HDD will not erase recordings before you can remove them for safe storage. The IP Pro app is easy to install and use, so you can view whatever is happening in real time. 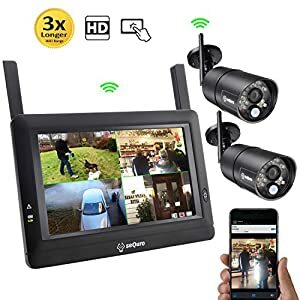 Bottom line: this is one great CCTV system to buy and install. 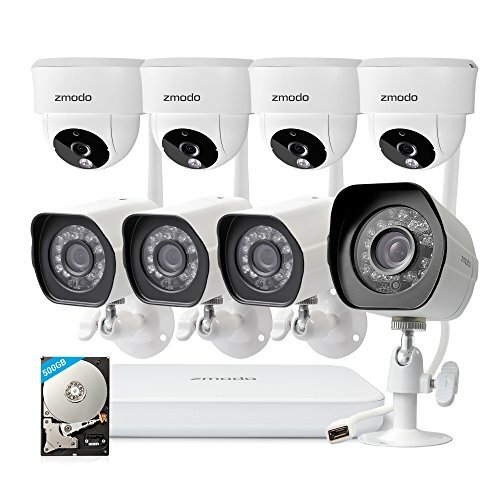 This Zmodo model comes with 8 cameras but only a 5ooGB HDD NVR. The cameras are Zmodos standard 720P so they perform well and give a clear picture. 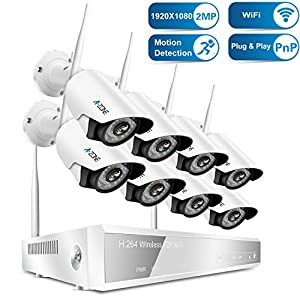 This is a wireless system, so the number of camera’s is only extra work to set up, but easy to install since they are wireless. Just take into account the battery life and costs. The system connects via the Zmodo app to any mobile device and remote location, so you will always be able to view the house whenever you need. 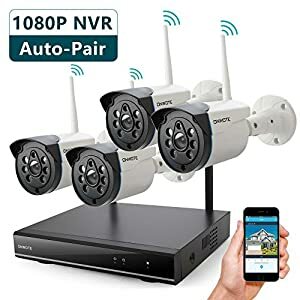 This is a great indoor and outdoor CCTV solution. My only reservations were the wireless installation for so many cameras mean that you need to replace 8 batteries every year. You also need to factor in the number of times the system will record from each camera and erase older recordings on a small 500GB HDD. Bottom line: if you are seeking a wide range covered solution but have a limited budget, then this is one of your best options. This is a wired system, which means that the cameras must be connected to a power source. 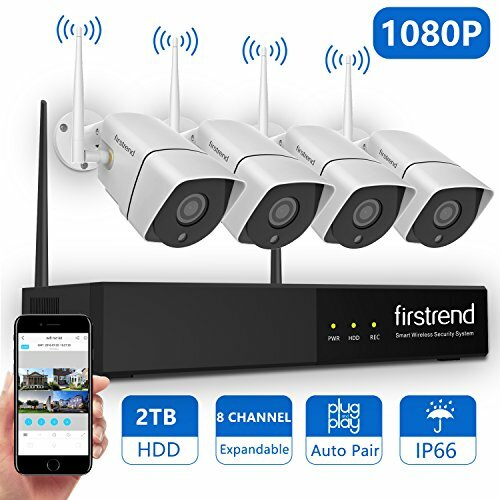 This is an auto repair system, which means that there are WIFI issues, the cameras will auto repair, so you don’t need to worry about any long-term offline issues. The NVR unit comes with its own built-in router, so you get added power and don’t need to rely on your home WIFI for data streaming. 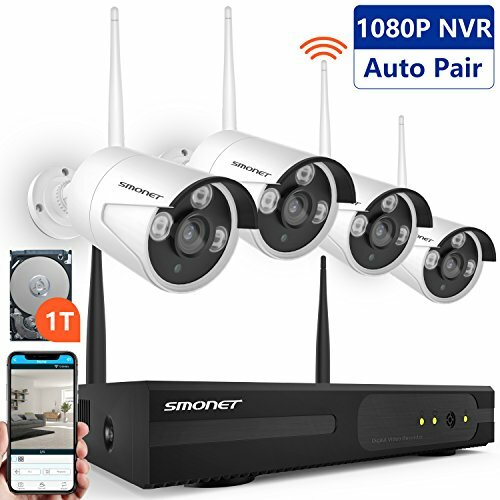 This system is suitable for both indoors and outdoors, with IP66 waterproof protection, so I didn’t need to worry too much about where I placed my outside cams. This was pretty straightforward to set up and connect. However, I needed to connect my HDD as well, which was annoying even though it took me all of three minutes to do so. This is a great unit but has two drawbacks, the first is that it doesn’t come with an HDD, this means that you need to buy your HDD, which is actually OK, since you get to control the size of your HDD. On the other hand, it means you have to source for a compatible HDD. The other issue is the strength of the WIFI signal, it can be problematic if you live or work in an environment with thick walls. 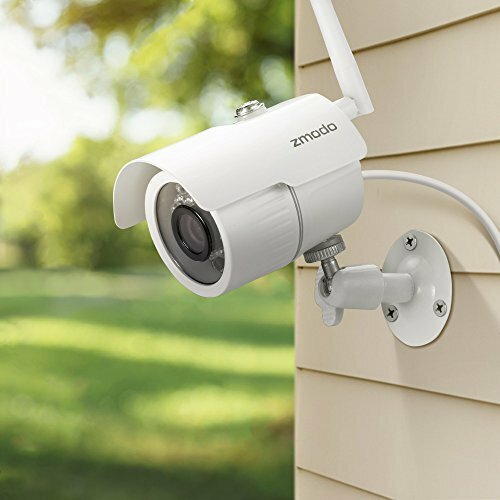 The upside, this system is more secure since it uses a separate WIFI router and is versatile for both indoors and outdoors. For the money, you pay you are getting a very good solution. Bottom line: This is great value for money, but remember to buy a large HDD, since this is a 24/7 recorder and will erase older video once the HDD is full. The HDD drive you need must be a 3.5” version. Also, if you connect this up to a PC monitor or TV, get the appropriate cable. This model will send you to feed to your mobile device, but you will need a cable to view the feed on site. 8CH 1080P Wireless NVR Recorder with 2TB Hard Drive. Hi-silicon 3520DV300 High-Speed Processor and Embedded Linux Operating System. Networking Protocol: UPnP, SMTP, PPPoE, DHCP, P2P, ICLOUD. 1 SATA Port, Up to 6TB, 1 USB2.0,1 HDMI,1 VGA. 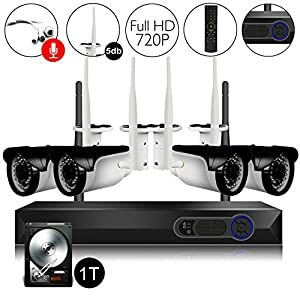 This is a 1080P HD security cam system with a 2TB HDD. This means that it will deliver high quality video and stills with enough drive space to allow safe capture without overwrite. The system is wired so there is a direct feed from each camera to the NVR. The installation process was straightforward. Since this is a wired system, I had to prepare the wires in a way that would elude detection, maximizing security efficiency. OOSSXX is a Chinese manufacturer of high quality security systems. They have a number of configurations to choose from and this particular one is their HD 8 channel version, which is more than enough for most household and business uses. I find their systems to be reliable and for the price you pay, very good ROI. The eight cameras provided really clear feedback and the only concern I had was the HDD size, with such an extensive system, this should come be 6TB HDD, however at the price you get this system, 2TB is a steal. 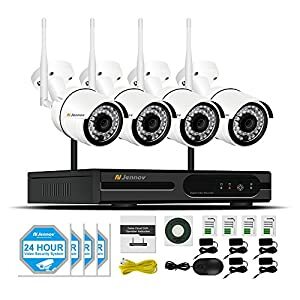 Bottom line: If you pay a bit more for motion detection, you will get a really impressive CCTV security system that would do most homes and businesses proud. 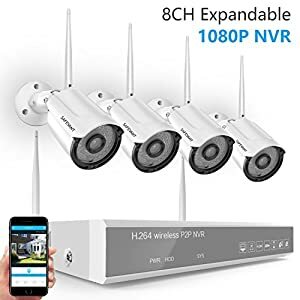 8CH 1080P Wireless NVR Recorder. Hisilicon 3520DV300 High-Speed Processor and Embedded Linux Operating System. Support for Android/IOS/PC Remote View. Networking Protocol: UPnP, SMTP, PPPoE, DHCP , P2P, ICLOUD etc. 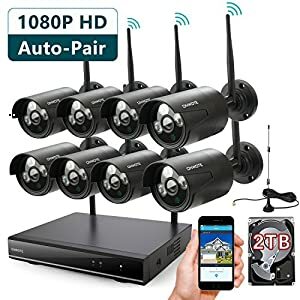 This is a 1080P HD security cam system with a 2TB HDD. This means that it will deliver high-quality video and stills with enough drive space to allow safe capture without overwriting. The system is wired so there is a direct feed from each camera to the NVR. 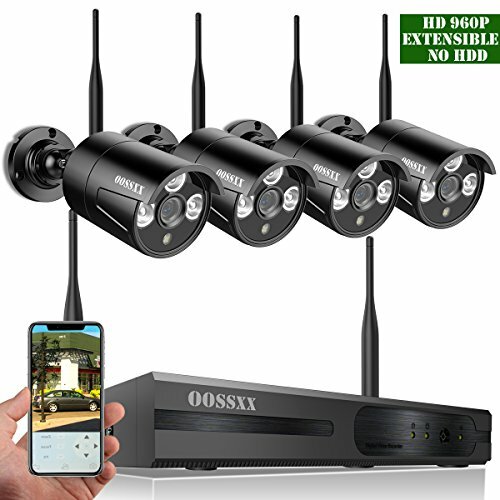 This is another good buy from OOSSXX the Chinese manufacturer of high-quality security systems. Just like the previous model that I reviewed, this particular one is another one of their HD 8 channel version, which is more than enough for most household and business use. I find their systems to be reliable and for the price you pay, very good ROI. The eight cameras provided really clear feedback and the 2 TB HDD was perfect for this model configuration. While it is a 1080P NVR, the cameras are 720P, which is a level down from their 960P cameras. In essence, this is a 1080P NVR with a 720P camera system. It’s cheap for the price when you compare it to their eight c960P camera unit, which is double the price, this is a better deal if you don’t need the extra coverage and quality form 4 more 960P cameras. Bottom Line: If its economy with quality that you seek, this is the unit you must get. 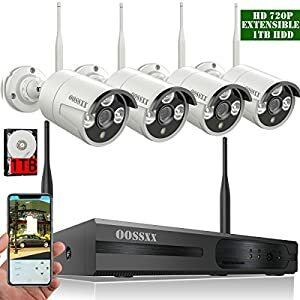 This OOSSXX system is perhaps one of the cheapest costing ones you can find and provides similar features to those that are priced 60% higher. 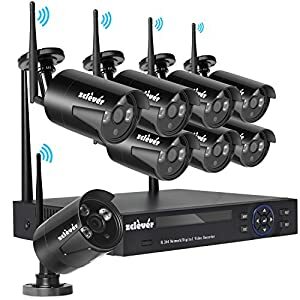 This is a standard 4 cam 8 channel security CCTV system that provides night vision and connects to the standard smartphone uplink. This is a wireless model, so there is no tinkering with wires and such. Installation is easy and once assembled its ready to go. The price was my only issue, for what you get you expect more. The HDD is 1TB and the NVR is compact, however, you get 4 960P IP cameras. Bottom Line: This is a medium range configuration that provides a basic security system. The software could be better, but there is a good customer service, so you are not left alone when facing any software or app issues. This I an all-weather wired system and functions very well at night too. It provides a clear picture, a stable NVR that has a 1TB HDD that seems to be the market standard. ZOSI is a known brand and their night vision cameras have proven reliable for years. The upside of this system is that its wired and night vision capable, the downside is that its wired, so you need to prepare the installation beforehand. As usual, ZOSI gives you a 1TB HDD, you will need more otherwise you will end up copying new recordings over the older ones. This is an IP night vision outdoor CCTV system that provides very good resolution in an easy to use package. Since it’s a wireless system its fast to install and fast to operate. 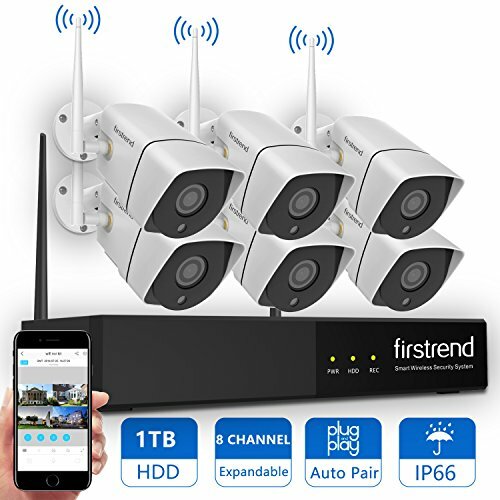 If its power, storage, and quality you are seeking, and are ready to pay the price then Firstrend is the system to buy. It delivers on all areas and provides a clear daytime picture as well as a very decent night time stream as well. 8CH 1080P Wireless NVR Recorder.1TB Seagate hard drive inside. Hisilicon 3520DV300 High Speed Processor and Embedded Linux Operating System. Support Android/IOS/PC Remote View . This is a great value for money kit, providing you with 4 x 720P IP camera resolution that is both crisp and clear to view. Once again, we are presented with a wireless system, so installation is a cinch. You just set up the cameras, turn on the NVR and sync the system. 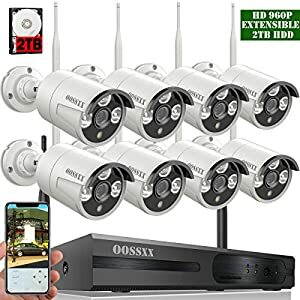 This is another OOSSXX configuration, in this one you get 4 720P cameras that provide ample coverage for the price you pay. In fact, the price is the main feature of this unit. If its value for money and a conservative budget than this is the model to get. Jennov is the brainchild of Google employees that broke off from papa Alphabet and set up their own security CCTV system company. I am not really concerned with their hardware since 90% of all electronics is manufactured in China. What gets me is their dedication to the IoT, and this is what you get here. A truly remarkable IoT security system that delivers on all fronts, including its price. This is a great IP cam that combines the IP stream with a wired cam for sustainable power. 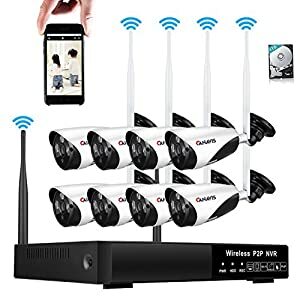 If you think that all IP (WIFI) cams are wireless think again. This one is a wired to power system, so I didn’t escape the necessity to wire up. It’s a motion detection activated system, so you save a lot of space on the NVR HDD. If you want real ROI then you need a dual wired and IP system that comes with motion detection, hi-res and a viewing screen to save you time setting up to a TV or PC monitor. This is what I got here. It was a treat to set up this system. It does cost a bot (60%) more than a standard system without motion detection and a screen. I found the additional cost worth the while. The motion detection is a great way to save on activation and you get alerts every time the system is triggered. (Even those rare but pesky false alarms were OK). Bottom line: GET THIS ONE! This is a classic night vision IP camera operated CCTV system that is perfect for the home or small business. The system is easy to install and operate, but you need to buy an HDD, don’t forget or you can’t record a thing? This is a nicely priced night vision surveillance unit that provides 960P HD vision and is totally wireless. The price would have been right if the unit came with a 1TB HDD, but it didn’t, so I had to spend more for this. Overall, it delivered a great picture, records well and has good remote control and viewing. 8CH 1080P Wireless NVR Recorder without hard drive. Networking Protocol: UPnP, SMTP, PPPoE, DHCP, etc. This is an 8 cam 8 channel1080P hi-res system that provides wireless adaptability with night vision and IP66 waterproofing. This was a treat to install. Its fully wireless and the software package was easy to set up. This is a really great system, so why the heck doesn’t it come with an HDD? For the price I paid it should have come with a limo and a box of chocolates. Yes, its pricey, but bottom line, its worth it. The system is truly versatile, provides motion detection and night vision so you save on disk space. Just remember to buy the disk first. This is another Firstrend system, the 960P one, which provides ample results but is a bit too pricey for my taste. However, if you are seeking a high end brand name then go for it. Once again, a Safevant system, but this time in 1080P. 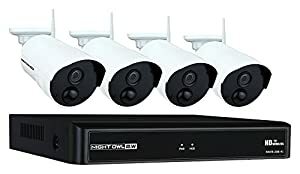 It delivers in all areas and provides a quickly installed, quickly operated and very good streaming CCTV system, and is well worth the price you pay for it. Bottom Line: a very good value for money unit that will provide you with top-level security monitoring. I am going to veer away from my standard review specification list and give the Sequero manufacturers spec sheet. The Sequero Guard Pro is a night vision wireless IP camera system. If its simplicity and the need to remove any technological barriers between the product and its owner, than this is the one to get. It’s a plug n’ play system, the ultimate Lego CCTV where you just install the camera’s turn on the unit and follow the steps. Bottom line: If its price and value that you are seeking with a non-technical over justification, then this is the one for you, and heck, they even give you a view screen for on-site viewing. Hisilicon 3520DV200 High Speed Processor and Embedded Linux Operating System. The installation process was straight forward. Since this is a wired system, I had to prepare the wires in a way that would elude detection, maximizing security efficiency. Do you remember the 8 cam 1080P OOSSXX review I did earlier in the article, this is the same one but with 4 cameras. The price is really gives a great ROI and is budget friendly. So, if you want that economical CCTV system that delivers 1080P quality streaming video, then this is the one to get. First, you need a screen to view the recordings, second you need to connect each camera to a power source, so while it is WIFI and transmits without a wire, it still needs wiring for power installation. While this save on battery replacements, it does present you with installation issues. 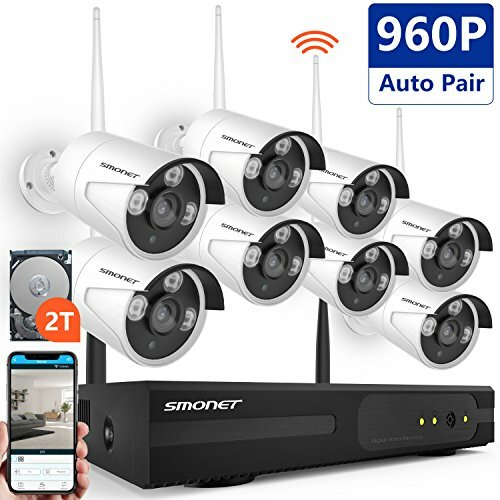 This is a the SMONET 960P system that provides better quality viewing properties and is slightly highly priced in my opinion. The 2 TB NVR disk is large enough for recorded video, but this system will overwrite old footage, so make sure you save all the important shots. I would recommend this one over their basic 720P system, even for the price they are asking. 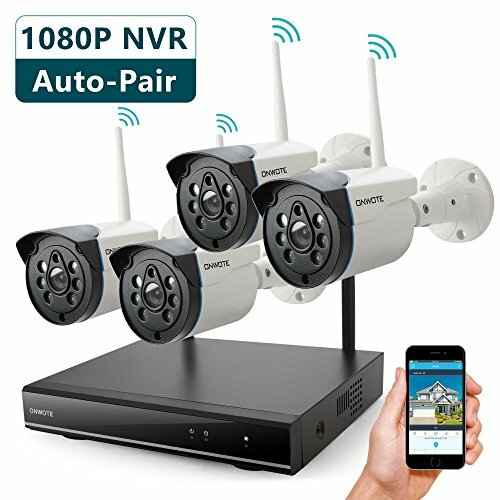 4CH 960P Wireless NVR Recorder. This is a classic IP CCTV system , it provides night vision and is waterproof. This is wireless system so setting up is a cinch. You do need to buy an HDD but for the price you pay, I won’t complain and neither should you. Finally, a system that’s so cheap you would think its unreal. It is very real, the only issue is I needed to buy a HDD, which I did, since it was worth it. The system delivers in every corner and proves that some cheap Chinese models are not just fake or mockups. 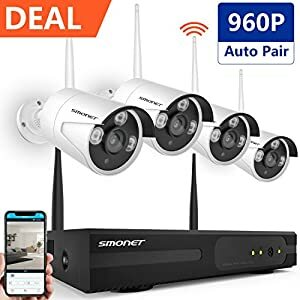 Bottom line: If you want a 960P night vision system, and don’t want to pay a lot because, heck, you ain’t got that much, or just don’t want to spend on a high end system that delivers the same thing, get this one. This is Night Owl’s 1080P security CCTV system that is night vision and wireless and perfect for any home or small business. This was easy-peasy to install. Just took it out, set it up and operated it. 1 x 4 Channel 1080p HD NVR with pre-installed 1 TB Hard Drive. 4 x 1080p Indoor/Outdoor Wireless Infrared IP Cameras. If you are looking for a system that is literally plug n’ play, this is it. However, you will pay for it. Since this is a high-end company selling high end products at high end prices. You get the best quality equipment, proven and reliable. You get the easiest remote controlling and monitoring app. You get the most versatile recording options system on the market. Bottom Line: High end and worth every cent. This is a video and audio CCTV system, so you can also record what is being said and not just see what is being done. As a home security system is great, at work you will need to notify your employees and visitors that they are being voice recorded as well. That’s the Law. Wile the cameras are wireless, they are not wireless for power. So, I needed to prepare the installation for power sourcing to each location. Other than this issue, everything went fast. Remember to buy batteries for the remote. This is another one of those wireless wired cameras that need a wired power source but stream through IP. This particular unit is only 720P so it’s not on the hi-res end of the models presented in this review. The reason its here is because its audio too, and for the price you pay, which is reasonable, worth every cent. 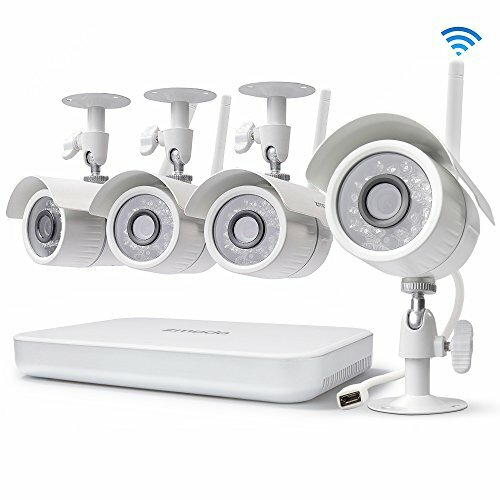 This is a high quality, high product that provides indoor and outdoor wireless nighttime and daytime CCTV security. 1× 4-Channel DVR with Pre-Installed 500GB HDD. 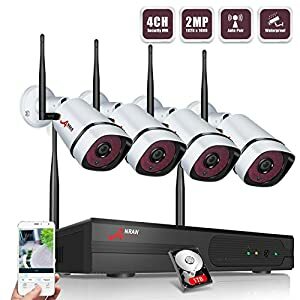 4× Wireless Bullet Cameras w/ Antennas. Lorex has been around for over 25 years. This is an American company that specializes in residential and business security systems. Their products are priced on the high end because they manufacture good quality and reliable equipment. If you can afford this system, buy it. The basics are this; Lorex gives you an easy to use smartphone/mobile app viewing system. The HDD is slightly small for my taste, especially forth price you pay, but 500GB is better then nothing and you can add more space. Since this is a motion detection system you can save of storage space and have it activated only when motion is detected, or you can have it set to continuous mode. 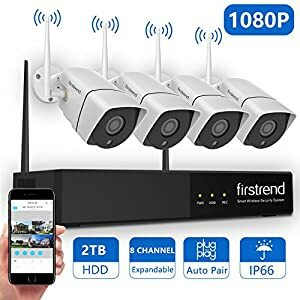 The cameras are auto-repair, which means when the WIFI signal is too low or off, the camera will reset the signal and transmit again or send a warning that the system has lost a camera signal. The night vision feature is great, reaches up to 40 meters (41 according to Lorex) I tested it, and yes, the night vision is to par. Bottom line: Worth every cent, you get quality and reliability. default factory resolution setting is 1280 X 1024. 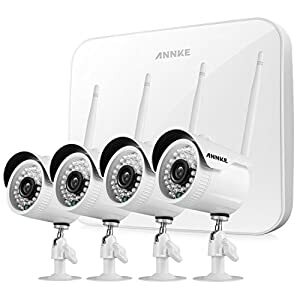 This is another quality Anran product, f you want real ROI then you need a dual wired and IP system that comes with motion detection, hi-res and a viewing screen to save you time setting up to a TV or PC monitor. This is what I got here. It was a treat to set up this system. It does cost a bot (60%) more than a standard system without motion detection and a screen. I found the additional cost worth the while. The motion detection is a great way to save on activation, and you get alerts every time the system is triggered. (Even those rare but pesky false alarms were OK). Bottom line: This is their 1080P model and costs a tad more than their 960P version, In terms of price ROI< this one is a bit more costlier and therefore sits well within the standards of its other competitors. So, its personal choice rather than price that will make the difference here. This is an 8 channel indoor and outdoor waterproof Night vision CCTV system. This is a wireless wired system, where the camera needs a wire power connection but transmits WIFI. So no cutting corners when installing. If it’s real ROI, don’t look further. This is an 8 cam, night time, weatherproof, dual wired power with wireless streaming system that provides a high quality stream of video. 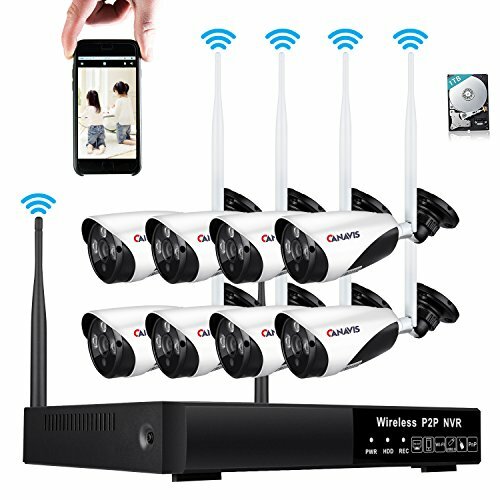 Just for all you readers that don’t know what or who Canavis is, well Canavis is another Chinese security cam system manufacturer that produces a great model. This version comes with a 1TB HDD and 30-meter night vision. I tried it, it works, its simple and they provide support via their website. This is a wireless 1080P hi-definition CCTV system with night vision and weatherproof cameras. This is a fully wireless system, so you need batteries for the cameras, other than that, it takes as much time as it takes you to position the cameras. The rest is a few minutes of fiddling with the NVR and presto your up and running. If its simplicity you want, then simplicity you get. The Reolink is a great system, a bit pricey in comparison to other similar products, but well worth the extra cent for its compact and reliable quality, as well as its simplicity. While I state simple, I don’t mean it’s a simple system, I mean its simple to install and operate it. 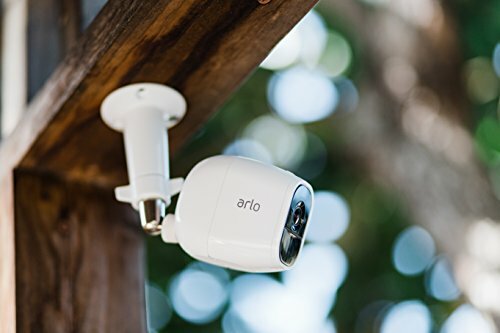 The system itself provides motion detection and night vision, so this is one that comes with all the bells and whistles and at 1080P is excellent ROI. This is a high-quality system at the price of a Chinese mockup, it’s phenomenal and perhaps the best buy in all this review. This is a wireless system, so is quick to install, and believe you me, this even quicker to set up. This is a Hong Klong based Chinese company with offices around the world. They provide really high-quality products at a fraction of the market price. With all this, its painful for me to say, but they are so good, and for the price you pay, you have to buy it now. I mean this, with tears don my eyes in frustration, buy one now you won’t regret it. Bottom Line: buy one of these, buy an HDD cos its not included (part of the price issue) and get ready for some motion detected action. 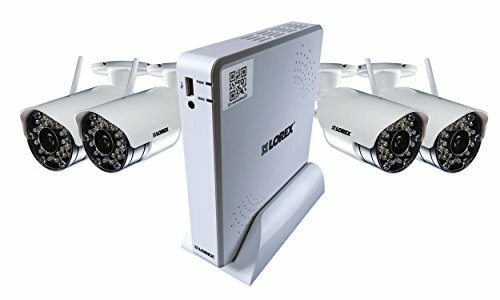 This is a high end, high quality CCTV system with 1080P quality frame. I don’t know, I am struggling internally to decide. While this system is exceptional, it comes with an exceptional price, as in too expensive. Sure, it comes with all the bells and whistle, strong WIFI signal, great 1080P quality and a nice 2TB HDD as well as an easy to use app…but still, the price! Bottom Line: If you don’t mind buying a Porsche Cayenne SUV instead of a Range Rover or Cherokee Chieftain than this is your model. This is a small business and home-based CCTV system, totally wireless and extremely easy to install and operate. I don’t have much to say, it’s easy to install, it’s easy to configure and it’s easy to use. Some companies make it easy for us reviewers to work. They take some damned good quality electronics, bundle it altogether an even better software system and then sell it for a reasonable price. This is what you get with Zclever, and honestly, I close this review guide with this product because I want you to buy it. You get great night vision, amazing WIFI control and remote access, and at the price they are providing it, damn man, I love it. Secured video streaming, in some instances audio streaming, night vision that can reach at least 20 meters, weatherproofing. 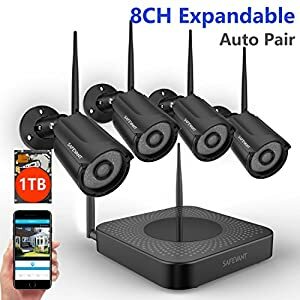 A large enough HDD or cloud and motion detection to both save disk space for recordings as well as to alert you whenever the system is triggered. If you intend to use it as a closed-circuit CCTV indoors then motion detection is not really an issue to contend with, storage space is the issue, since you will be recording constantly and that takes up space. Do you want a fast installation, then you need wireless. The downside is that the cameras need to have their batteries replaced frequently. The further away you want to capture images, or the more details you want in the image captured will require higher definition. Higher definition costs more and takes up more storage space. Do you need to see what’s happening in the dark? If yes, then you will need an IR system. Do you want to know when the system has detected an intruder, then you need motion detection. This will also save you storage space, since the system will only record when activated. Do you want to hear your intruders? Then get an audio camera system, just remember that at work you will need to tell your employees and visitors that they are being recorded. This is now a standard, so I won’t say more than just check to see how easy it is to link into your system and is it hack proof? Always double check the price of systems, look at definition, channels, number of cams, night vision, audio and motion detection. Compare the cams and then decide which company gives you the best customer support service.